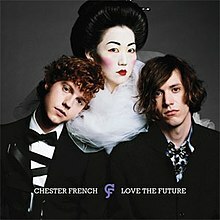 Love the Future is the debut album by the band Chester French, which was released on April 21, 2009 under the record label Star Trak Entertainment. Love the Future was primarily recorded while the duo attended Harvard University; they recorded most of the songs during class and study breaks at a Harvard recording studio. After recording the album, lead vocalist David-Andrew "D.A." Wallach sent the work to several record labels. The band received recording contract offers from Kanye West's GOOD Music, Jermaine Dupri's Island Def Jam Music Group, Pharrell Williams Star Trak Entertainment and several independent record labels; they ended up signing with Star Trak. Love the Future received generally mixed reviews from music critics, receiving an aggregated score of 59 out of 100 on MetaCritic. Christopher Muther of The Boston Globe felt that the album was "too wise" and "too catchy" to possibly be the debut of Chester French. He compared the songs to that of the band Fountains of Wayne. Heather Phares of Allmusic called the album "much better" when the duo "tones down the hyperactivity and sticks to making songs with ridiculously ingratiating hooks". Wallach's voice was compared to that of Carl Wilson of The Beach Boys. All songs written and composed by David-Andrew "D.A." Wallach and Maxwell Drummey. ^ Bradley, Bill (2009-03-10). "Chester French Love the Future out April 21st". Vanity Fair. Condé Nast Digital. Archived from the original on 2009-04-08. Retrieved 2009-04-14. ^ a b Muther, Christopher (2007-07-08). "Retrograds". The Boston Globe. The New York Times Company. Retrieved 2009-07-15. ^ a b Phares, Heather. "Love the Future - Overview". Allmusic. Retrieved 2009-04-21. ^ Maerz, Melissa (2009-04-21). "Love the Future". Blender. Alpha Media Group. Archived from the original on 2009-05-22. Retrieved 2009-07-15. ^ a b Muther, Christopher (2009-04-20). "Chester French, 'Love the Future'". The Boston Globe. The New York Times Company. Retrieved 2009-04-21. ^ Wood, Mikael (2009-04-14). "Love the Future - Music Review". Entertainment Weekly. Time. Retrieved 2009-07-15. ^ Cooper, Leonie (2009-06-02). "Album review: Chester French - 'Love The Future'". NME. Time. Retrieved 2009-07-15. ^ Steve Hammer, M. (2009-05-07). "Chester French - Love The Future". Okayplayer. Retrieved 2009-07-15. ^ Hoard, Christian (2009-04-14). "Love the Future: Chester French: Review". Rolling Stone. Wenner Media. Retrieved 2009-07-15. ^ Dolan, Jon (2009-05-20). "Chester French, 'Love the Future' (Star Trak/Interscope)". Spin. Spin Media. Retrieved 2009-07-15. ^ Norton, Maiya (2009-04-21). "Chester French: 'Love the Future'". Vibe. Vibe Media Group. Archived from the original on 2009-04-27. Retrieved 2009-07-15. ^ "Love the Future by Chester French". MetaCritic. Retrieved 2009-07-15. ^ Norton, Maiya (2009-04-21). "Chester French: 'Love the Future'". Vibe. Vibe Media Group. Archived from the original on 2009-04-25. Retrieved 2009-04-21. ^ "Artist Chart History - Chester French - Albums". Billboard. Nielsen Business Media. Retrieved 2009-04-30. ^ "Top Internet Albums - Love the Future - Chester French". Billboard. Nielsen Business Media. Archived from the original on 2017-02-02. Retrieved 2009-07-15. This page was last edited on 6 November 2018, at 19:55 (UTC).